In Marrakech we don’t have much of a winter. The temperatures might drop but they never reach freezing. We have snow but it’s high up in the mountains. It took me a long time to discover the little bits and pieces of Christmas that arrive in mid-December. Instead of feeling depressed in December we went to Berlin last year where the promise of markets teeming with the sights and smells I missed could be found. But is it a good idea to go with kids and what can you expect? 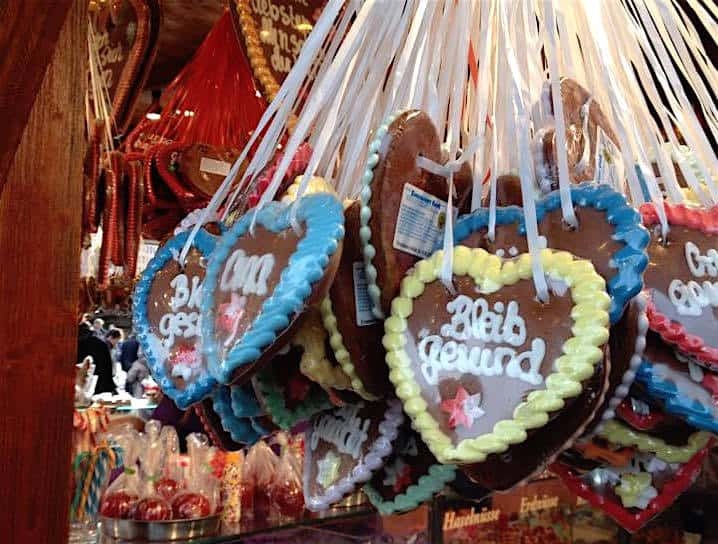 Our kids had a wonderful time in Berlin and loved discovering markets all over the city. If you’re thinking of visiting Berlin in December, here is our guide for where to go, what to see and do, and most importantly what to eat! 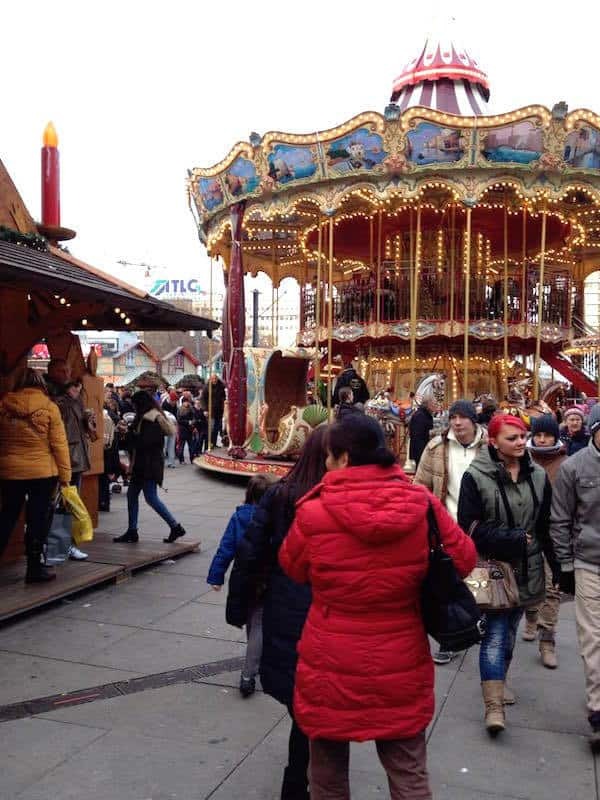 Typically the Christmas markets open at the end of November and run through Christmas. This was one of our favorite markets because of it’s huge size. In the middle the boys discovered an ice skating rink and we rented skates to give it a go. Even though we spent a large part of their lives in northern Wisconsin they had never ice skated! So I laced up a pair and took to the ice to show them how to do it. 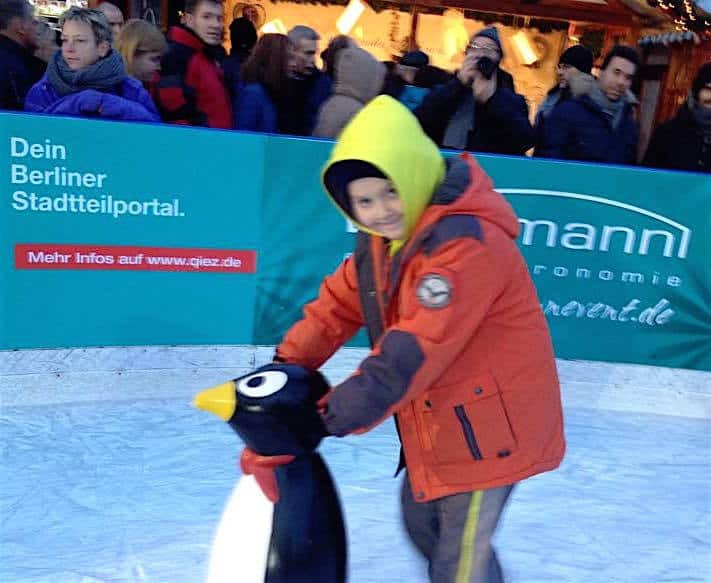 I never imagined I’d teach my kids to ice skate on an ice rink at a Christmas Market in Berlin! They have small penguin sliders available to also help. I highly advise renting one of these to get the kids feeling like they are successful before setting out unaided. They’ll get the feel for how to skate and balance with support. It’s more fun for them until they really get the hang of skating. Skating was very affordable. It was under 10€ for each to rent skates and a penguin slider, you can of course bring your own skates. There were several tables set up with fire pits in the middle so you could warm up and have a drink. The amount of hot chocolate we drank during our stay was crazy! If you drink alcohol, try the gluhewein. There are plenty of other warm drinks available also. You will discover there are stands just for drinks and stands for food. We didn’t end up eating at this market opting for dinner nearby instead. There also were many craftspeople here not only selling their goods but making them. Wood carving, glass blowing, blacksmiths and more. It’s a great way to see traditional German craftsmen and women at work. For younger kids there are also a few rides that they may enjoy. I can not find the correct name for this market but if you search for the Neptunbrunnen or Neptune Fountain you’ll find this smaller market. This was the second place the boys went ice skating and we spent quite a bit of time. The food here also was great. We discovered hand pies from Dresden (Dresdner Handbröt) that was cheese and mushrooms wrapped in bread with sour cream on top. There also was chicken cooked over an open fire and sausages if you prefer. We ordered fresh cut potato chips to snack on and more hot cocoa. It’s worth noting if you are going to stay in the market area (this goes for all markets) your drink will come in an actual mug unless you specify otherwise. You pay a deposit for the cup and then get it back when you return the cup. Of course you can decide to keep the mug as a souvenir as well. A sledding hill in the middle of a major city? This man made run with views of the Brandenburg Gate is quite the site, and major fun for kids. Our boys were besides themselves with excitement when they saw the sled run. The price was a few euro for a single ride with a discount for multiple runs. Our advice? Buy the big package, the kids will want to go multiple times. There are lots of food stands though we were unable to eat at this market as all of the food offerings contained pork. 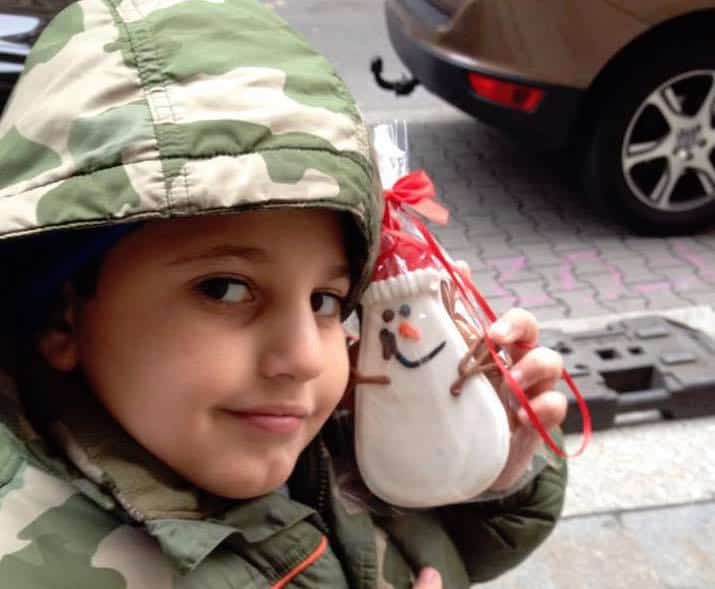 There were sweet treats like gingerbread cookies, roasted nuts and more. You’ll also find craft stands on the street just to the right off the platz. This is a really long name for one of the most popular markets in Berlin. This is one of the few markets that you do need to pay a small admission fee (1€ per person). We found some really good food here, including a restaurant that served only potatoes in a variety of ways! (You know we ate there for sure!) Many of the food sellers have samples available and you can try many different things at no cost. As is typical there are lots of booths selling different craftworks. There also are lots of snack stands, so eating your way around is completely possible. There are many tents that are enclosed and warm. If you need to take the chill off do this. We debated between the potato restaurant and a northern Italian tent that had delicious looking pizza and risottos. The food is a little more expensive but worth it if you’ve got cold kids! When we visited there was live music from a choir and an orchestra. If you stay until it gets dark there are 1,000 strings of light framing the market. A truly beautiful sight with the Französischer Dom light in the background as well. What Else Can Kids Do in Berlin? While we had a great time visiting Christmas markets that isn’t all we did! We tried to mix indoor and outdoor activities. 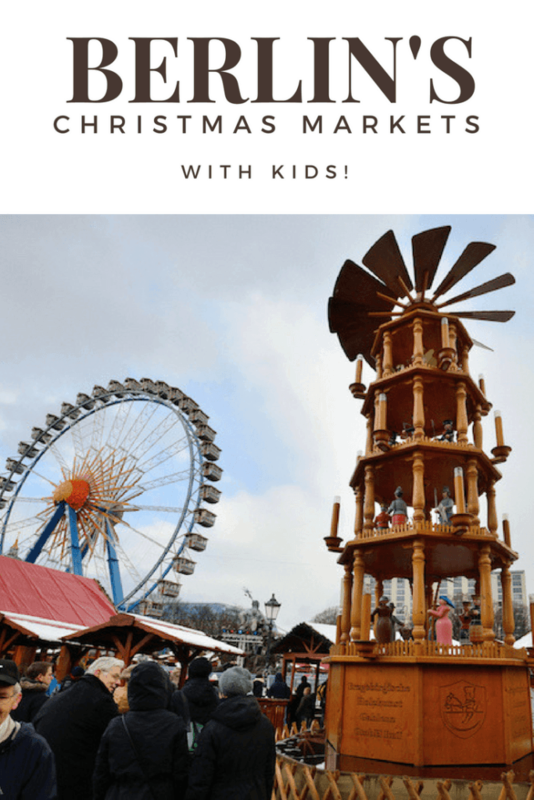 I wrote a post on top 10 things for kids to do in Berlin when we got home last year. Some of our favorites were visiting the DDR Museum and the Ritter Sport chocolate factory and museum. We also tried to mix in a bit of learning about this very historical city like a visit to the Berlin Wall. I found this a bit complicated to try and explain certain monuments and locations in ways that the kids would learn but not be overwhelmed and/or scared. There were many other things we could have done were they a bit older, but that’s for another trip. Germany’s capital city has gained a reputation as one of the most affordable destinations in Western Europe and has a large expat population who call it home. The city has an excellent public transportation network to get you anywhere. Everything is very punctual and clearly explained (this is not always the case in other countries). The German people are incredibly kind and helpful. You do not need to speak German, nearly everyone speaks English however some German phrases will go a long way to make your experience nicer. I took several years of German in school and found communication quite easy. People always appreciate when you speak a little of their language. You’ll likely be able to pick it up easily as many German words are similar to English words. Guten Abend – Good night. Kannst du mir helfen? – Can you help me? Berlin Schönefeld is where we arrived, other flights enter via Tegel airport. Berlin is also constructing a new airport; Berlin Brandenburg. When completed all flights into Berlin will arrive here. All airports are connected to trains and public transportation that is regularly scheduled and affordable. Remember, days are much shorter the farther north you get. Daylight in Morocco is nearly the same year round so we did have some adjustment issues. The sun wasn’t up until after 8am and would start going down by 4pm. This doesn’t mean you can’t enjoy Berlin in the dark, just be aware of this. There are a lot of different options for places to stay in Berlin but we opted for the A&O Hostel near the Hauptbahnhof. This location worked really well for us because it was central. We weren’t very familiar with Berlin so we didn’t know which neighborhood would be the best especially for transportation choices. While I had never stayed in a hostel with the kids before this was a good choice. We had a private room with a double bed for us and bunkbeds for the kids. We could have fit 4 more kids in the room too. The price? Less than $50 per night. It was super clean and there were no issues with loud nights or inappropriate behavior. Our final tip for eating? There is a LOT of great Turkish food in Berlin. The price is reasonable and there are plenty of vegetarian options too. We ate several meals in various restaurants in all parts of the city and the kids were always happy with it. Thanks so much to Visit Berlin for helping us with a Berlin Welcome card for transportation and admission to various attraction in the area. 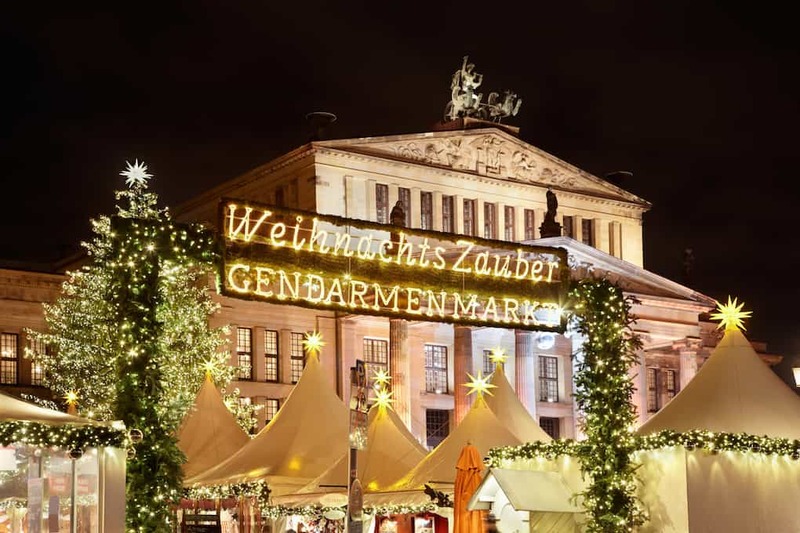 They have a great page full of Berlin’s Christmas markets to help you plan your visit!